This was an unexpected surprise! After seen the trailer for “The Fighter” I didn’t really think much of it. Then I saw that it was directed by David O. Russel and remembered how much I hated I Heart Huckabees. Oh dear, I thought to myself, this isn’t going to be a happy viewing… Oh, how I was wrong!!! This is now probably in my top 10 film of the year (or even top 5 dare I say). The trailer makes it look like another film about a boxer, filled with violence for the latest testosterone generation, yet this film is as much as boxing as the first Rocky was, actually even less. And just like that film (I’m sorry but the parallel is inevitable), it’s a story about an underdog, a rag-to-riches tale, a story about characters more than anything else. 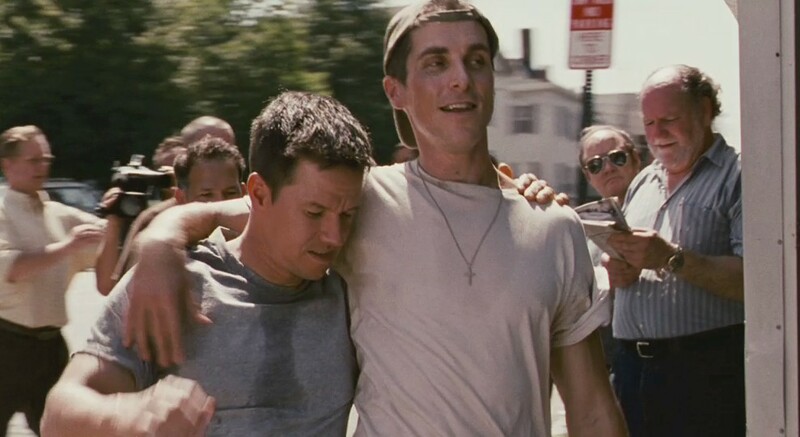 At the centre of the action is the relationship between two brothers: the boxer “Irish” Micky Ward (Mark Wahlberg) and Dickie Eklund (Christian Bale) who helped train him. At this point I must confess my complete ignorance about any type of sports. So much so that I had never even head of Micky Ward so the whole turn of events was a complete surprise (including the ending). The thing that will strike anyone watching the film is the acting of pretty much everybody in it. Once again (as he had done for the Machinist in 2003) Christian Bale has lost a lot of weight reportedly by eating very little. He researched the part by taking notes on Eklund’s mannerisms and recording conversations for the character’s distinct accent. Apparently he even stayed in character throughout filming. Well, whatever he did, it really works. Bale transformed himself completely for this film and it’s hard to believe that he’s the same person behind the cape in Batman or even in Terminator: salvation. And as an extra proof of how good Christian Bale is in the film, when during the end credits we are treated with some real footage of the real people in the film, we can be amazed by how similar his mannerism and accents are. Because of the part itself, Bale is really the one who steals the show every time he’s on-screen, however Mark Wahlberg is also very good too in a much more understated act, which almost goes unnoticed. Never for a moment you doubt that he’s actually anything but a boxer (apparently he even had a boxing ring in his back garden during the making of this film). But the big surprise for me was Melissa Leo who plays the mother in the film: a relatively unknown actress and yet a great force of nature in the Fighter. The film is very nicely balanced, has a very good pace, a tight script and a nicely controlled and never showy direction. The only noticeable choice was the way they decided to film the few fight sequences in the film, by using video as opposed to film (or at least it look that way), by making the inter-cutting with the real footage seamless. This is a beautiful movie which probably hasn’t got anything new that we haven’t seen before but it’s got a moving story that rings true at every step and will make you laugh, cry and cheer all the way to the last frame and it’s done with such simplicity and sincerity that it’s hard not to admire.